The Große Heidelberger Liederhandschrift, more commonly known in English as the Manesse Codex, is an illuminated book of love songs that was compiled in Zürich at the turn of the 14th century C.E. (with some additions around 1340). It is currently in the collection of the Heidelberg University Library. The songs in the book are divided into 138 chapters. Each chapter begins with a full-page illustration (though one of these is only a sketch, and two others are only partly painted). Almost all of them include examples of one or more of five types of heraldic display: shields, crests, banners, heraldic surcoats, and horse caparisons. I have extracted shields and escutcheons, crests, caparisons, and banners from the illustrations in the codex and put them in tables so that they may more easily be considered as collections. This is the index to those tables. I have not attempted to similarly deal with heraldic surcoats largely because I find it difficult to distinguish between heraldic clothing and merely colorful clothing in a significant number of the images. I have included in this index minimal statistical information on the various elements I've collected, for the convenience of those who might be interested in trends and patterns. More detailed statistics are presented on the individual pages, above the tables to which they relate. Heraldically-painted shields and/or escutcheons appear in117 of the illustrations, either as part of a scene or at the top of the page. Some of them represent the song-writers whose works are found in the chapters they head. I cannot say how many of them are attributed, and how many were borne during the indicated individuals' lifetimes. They are grouped according to content, like charges with like, in three tables. Table 1 features 59 devices with animate charges. Table 2 includes 40 devices with inanimate charges. Table 3 contains 32 devices with uncharged fields or fields charged only with ordinaries. 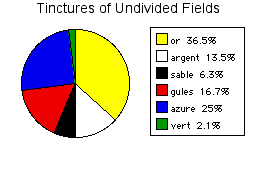 For those that might be interested, roughly three-quarters of the devices have undivided fields, and almost all of the charges are essentially single-tincture (with perhaps some details in a second). 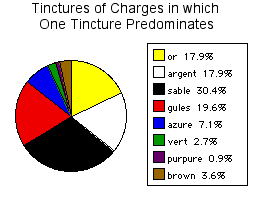 Or is the most common field tincture, sable the most common charge tincture. More detailed information about the tinctures used in devices in this document are available on a separate page. Helms bearing crests appear in 110 of the illustrations, either as part of a scene or at the top of the page. Most are paired with shields or escutcheons on which are painted heraldic devices. They are grouped according to their relationship to the devices borne with them. Table 1 features 2 crests that appear, atop helms, as charges on the shields that accompany them and 25 crests that exactly reproduce the devices with which they are paired. Table 2 includes 54 crests that reference the devices with which they are paired, without incorporating them in full. Table 3 contains 17 crests that have no heraldic content (aside, in some cases, from some tinctures) in common with the devices with which they are paired. Table 4 holds 14 crests that appear without accompanying shields or escutcheons. For those that might be interested, that means that in this particular text, more than three-quarters of the crests paired with devices share significant heraldic content with them. Horses wearing caparisons appear in 19 of the illustrations. They are presented in two tables. Table 1 features 19 horses with riders who have shields. Table 2 includes 19 horses not pictured with riders with shields. For those that might be interested, almost three-quarters of the caparisons shown with shields closely match them. Banners appear in 11 of the illustrations. They are presented in a single table. For those that might be interested, 80% of the banners carried by people very closely match shields or escutcheons borne by the same individuals or their leaders.